We sell only native hard shell lobsters, shipped overnight. Our commitment to quality lobster delivery has earned us the reputation of being one of New England’s premiere seafood specialists. When you want the best in mail order lobster, look no further than Woodman’s of Essex. We sell only native hard shell lobsters, shipped overnight. Our commitment to quality lobster delivery has earned us the reputation of being one of New England’s premiere seafood specialists. 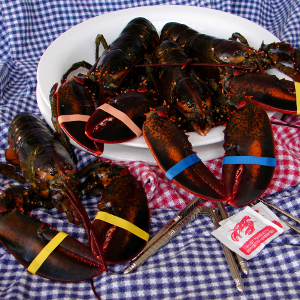 Authentic New England lobster delivered right to your doorstep? You bet – this is the real deal. 3 days notice needed for shipment. Deliveries available Tuesday through Saturday.